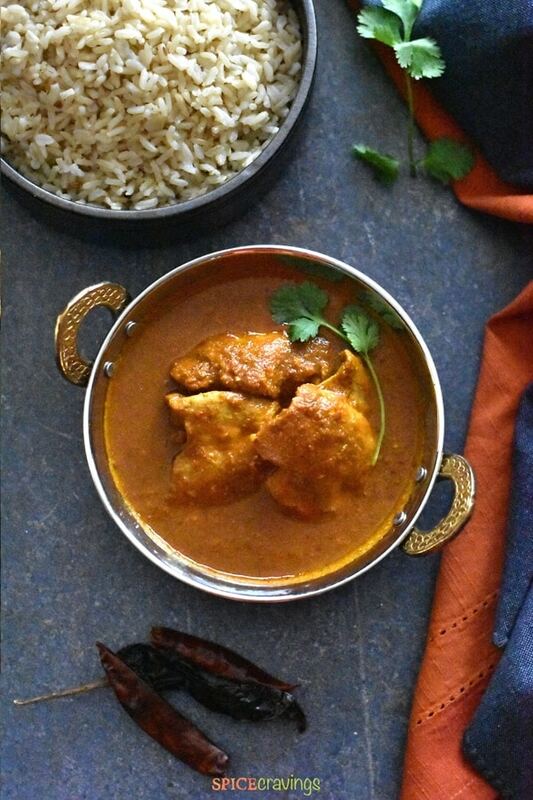 Chicken Vindaloo is an extremely popular curry from the Goan region, in the western coast of India. It is a local adaptation of the Portuguese dish, carne de vinha d’alhos, which literally means, meat marinated in wine and garlic. Mild Indian red chillies, blended with aromatics and vinegar, give this dish its signature taste. Traditionally vindaloo is prepared with pork. Natives from the Konkani region in Goa prepare a marinade by pureeing together pre-soaked dried red chillies, local Goan wine called Feni, tamarind paste, fresh garlic and ginger, and an assortment of toasted Indian whole spices, called Garam Masala. They marinate the pork meat in this mix for a few hours. Then, they cook the pork in this marinade, till it forms a rich vindaloo curry. 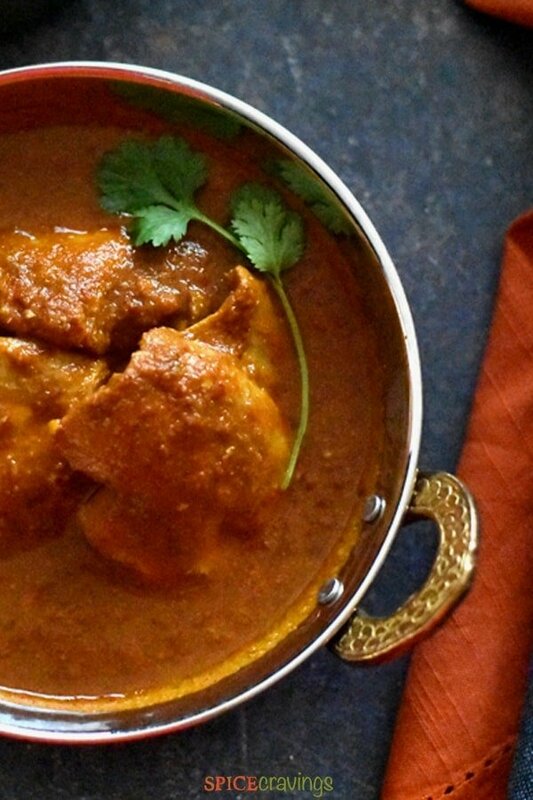 I adapted the traditional recipe to make Chicken Vindaloo, which my families simply adores. With a few tweaks to an authentic vindaloo recipe, I turned it into a weeknight-friendly recipe that can be made in under 30 minutes. Should you brown the chicken or not? I get this question from many readers. Before finalizing this recipe, I actually tried a few batches where I browned the chicken pieces before adding in the sauce, but I didn’t notice any major difference in taste. So, now I skip the browning process when making this dish with chicken. You can just as easily make Lamb Vindaloo with this recipe by increasing the cooking time and adding a step. When I make Lamb Vindaloo using this recipe, I prepare the vindaloo sauce as per instructions. Then, I brown the lamb pieces for 3-4 minutes before adding the sauce, and then pressure cooking it. It adds a depth of flavor to the vindaloo curry. pressure cooker recipe, for this slow-cooked classic. 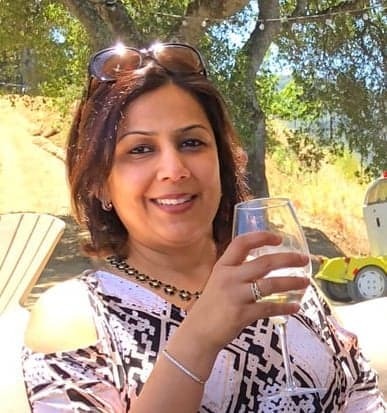 I use red wine vinegar as a substitute for the local Goan “Feni” wine and tamarind paste. Red wine vinegar has a nice sweet, tart and sharp flavor, which is a close match to the Goan wine, Feni. It also provides a subtle tart flavor, which I would otherwise get from tamarind paste. I use whole dried asian red chillies, soak them in warm water to rehydrate them, and blend them with sautéed onions, ginger, garlic and vinegar. These chillies add warmth and flavor versus ‘heat’ to this dish. They have a subtle earthy and smoky flavor, which adds a unique taste to the curry. 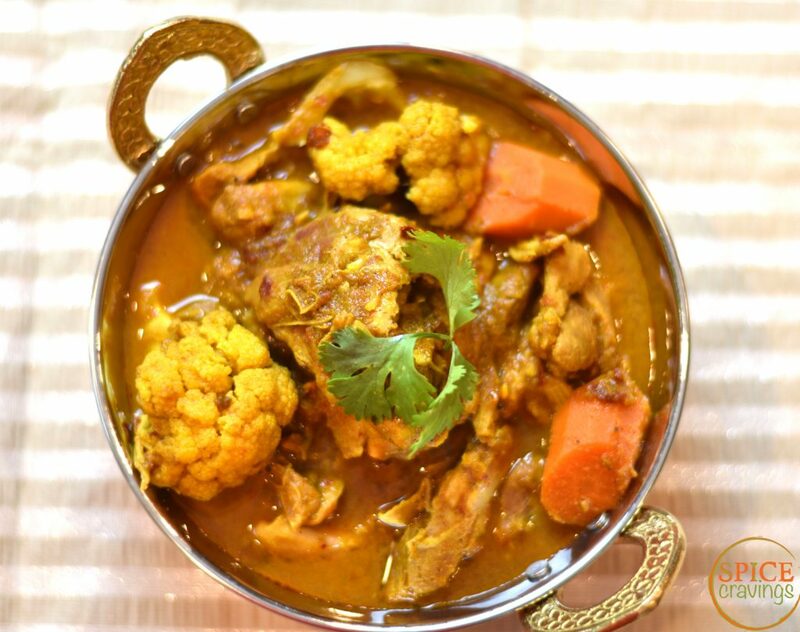 Towards the end of the cooking process, I add a pinch of sugar, or a splash of coconut milk, which balances the flavors and elevates the flavors of this vindaloo curry. There are two common misconceptions about the Vindaloo recipe. The first is that it’s a spicy curry. The recipe for a typical Vindaloo curry includes pureeing a handful of dried chilies, but these chilies are more for flavor and color rather than spice, a lot like paprika. The end flavors are ‘earthy and aromatic spicy’, not ‘hot spicy’. However, if you want to make it spicy, you can always increase the quantity of chilies, or, add a pinch or two of cayenne. The second confusion is caused by many restaurants, by adding potato in this curry. The Hindi word for potato is “aloo”, which coincidentally rhymes with the name of this curry, Vindaloo. There is no connection between potatoes and a vindaloo curry. 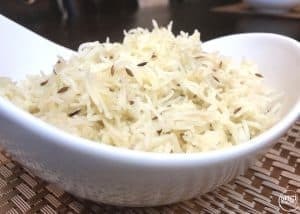 I use whole Kashmiri Red Chilies for this recipe. These chilies have the perfect balance of heat, smokiness and flavor. They’re mild to medium-hot in taste, which let’s all the flavors shine in this curry sauce, without overpowering it. 2-2.5 tablespoons of Paprika + 1/4-1/2 teaspoon of cayenne powder. Traditionally a vindaloo curry is served with toasted dinner rolls called Pav, pronounced as Pa-aw, in Hindi. A close and delicious substitute for that would be some toasted french baguette. I love to serve Chicken Vindaloo with Cumin Rice as my kids love this combination. We also enjoy a side of cooling Cucumber Raita with it. Try it sometime! 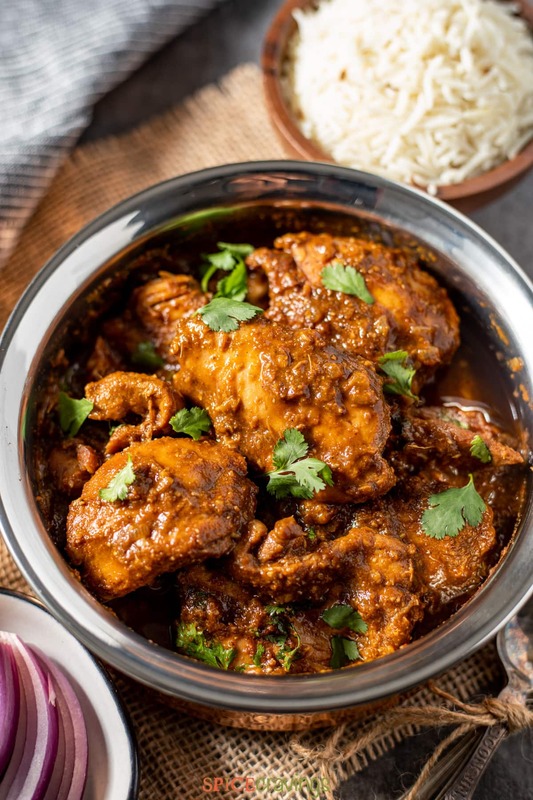 If you’re eating a low-Carb or a Keto diet, this Keto Version of Chicken Vindaloo will be a perfect dish for you. I combine the delicious flavors of this recipe, add cauliflower and carrots, and make a stew-like meal out of it. I don’t miss the rice or naan, and it tastes divine by itself! 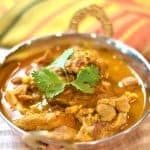 This Chicken Vindaloo recipe is a variation of the popular Indian curry dish from Goa on the west coast of India. I tweaked the traditional vindaloo recipe to make it a weeknight recipe that can be made in 30 minutes. Soak dry chillies in 1/2 cup hot water. Keep aside for 10 minutes. Turn ON Instant pot on sauté mode. Add oil and heat for 30 seconds. Add onions and sauté for 2 minutes, till soft. Turn off the Instant Pot. Cool onions for 5 minutes. Transfer the onions in a blender, add re-hydrated red chillies with their liquid, ginger-garlic paste, red wine vinegar, all dry spices, salt and sugar. 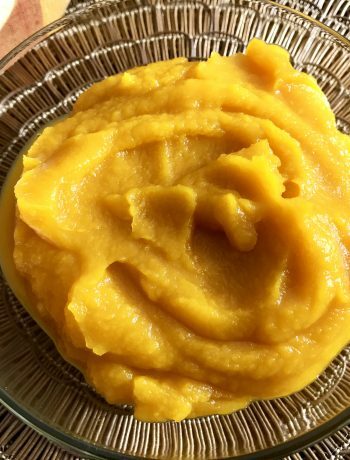 Purée into a smooth paste. Turn ON Instant pot. Add spice purée, 1/2 cup water, chicken thighs and mix well. Close the lid, turn the vent to sealing position. Cook on Manual (high-pressure) for 6 minutes. Let the pressure release naturally (NR). Garnish with chopped cilantro. Serve with steamed rice or toasted french bread. Enjoy! Follow Steps 1 & 2 from the instant pot recipe above. Add spice purée and chicken thighs to a saucepan and saute for 2-3 minutes. Add, 1/2 cup water and mix well. When the curry starts simmering, cover with a lid. Reduce the heat to medium and cook for 10 minutes, till the spice mix has turned into a smooth curry. Stir once or twice in between to prevent the sauce from burning at the bottom of the pan. Garnish with chopped cilantro and serve. Even though this recipe uses chilies as a base, the curry is not too spicy. It has the flavor from the chilies, not that much heat. If you prefer a milder flavor, de-seed the dry chilies before soaking them in water, OR, do half the chilies along with 1 tablespoon paprika powder. For chicken, I tried browning the meat before adding in the sauce, but didn't notice any major difference. So, I skip the browning process when making this dish with chicken. I do that when I'm making this with lamb though. ❤️ For more quick & easy recipes, JOIN ME on Facebook or Instagram, Youtube and Pinterest. Yeah, the chilies are dry. Can I send you a picture of result? Thanks. From what I’ve read, it has led me to believe it is a chemical reaction with the garlic, but I cannot confirm. I’ve used these chilies, or I’ve used just powder, or I’ve used fresh green chilies. I agree, sometimes garlic and vinegar react and cause the green color, but I don’t think that’s the cause here. One way to test it would be to replace fresh garlic with garlic powder and see. Green chilies don’t work in this recipe. If you want, make it with Arbol or ancho dry chilies. Hi Paul, I am still trying to figure out why it turns green for you. It has never happened to me or other readers. The fact that you tried other recipes and they turned green as well, makes me wonder about the quality of your chilies. Maybe they’re old. Did you try making them with any other chilies like Arbol or similar? I have listed a few other chili choices in the post, if you want to give it a shot. In the meantime, I’ll keep searching on why your curry turns green. MIne turned green. I can’t seem to make a vindaloo without it turning green and tasting weird. What gives? Hi Paul, that’s so strange. I’ve never had, or heard, of that experience. But let’s try to solve this mystery. What chilies did you use? Did you make any improvisations to the recipe? HI again! Its possible it was my chilies. I think they were much smaller and hotter than pictured. They were chilies japonese. I think it made it less red and made other flavors burn a bit too much. I’ll try it with kashmiri chilies. I will be making this again! I see! Yes, that could be it. If you can’t find Kashmiri chili, you can substitute with a mix of ancho chili and arbol chili, OR, some Guajillo chilies with some cayenne pepper powder. I”ll add this section to the post,I’m sure many people would want to know a close substitute- thanks! I jut made this.. It ended up green. Is the coriander powder supposed to be 1 tbs? It felt like it was a bit strong. Other than that, it was very tastey.. I will just reduce the coriander next time. Hi Mandy! I’m so glad you enjoyed the taste. Thanks for trying the recipe and sharing your feedback! As for the green color, heat/cooking turns ground coriander into a brownish color, it’s definitely not supposed to turn green. May I ask which brand of coriander did you use? As for quantity, I add a tablespoon, but you can certainly customize to your taste and add 1.5-2 tsp. Should I use Kashmiri chilies for this ? Yes, those will be great in this recipe. Vindaloo is a popular Indian curry dish from Goa and is always made with Pork. Chicken and beef or any other meat are just adaptations. That’s right Fernandes. 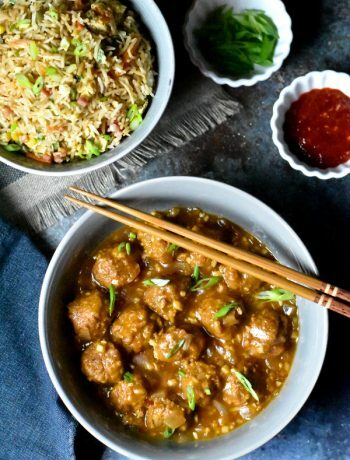 I use a slightly different spice blend and cooking style when I make this with Pork. Will post it soon! Thanks VP! This was a weeknight version so took a short-cut. Result was still pretty good. I will do one more version with browning the meat and post it soon. I wish you would do that because I just made this and I thought of browning it but the instructions didn’t say and also, what do you do with the garlic/ginger mix? It’s not a dry ingredient, so I wasn’t sure. Also, what about the Red Wine Vinegar? Can you clean this recipe up, especially when us first-timers find it? Hi There! Thanks for leaving feedback- very helpful for me. I have updated the instructions to include the two missing components. Did you watch the video? Also, I have updated my opinion on browning chicken for this dish. When I browned chicken before adding, I didn’t find any significant difference in overall taste ,so prefer this recipe as-is. If you were marinating the chicken in the spices, then browning would help enhance the taste. Thanks again for your feedback! 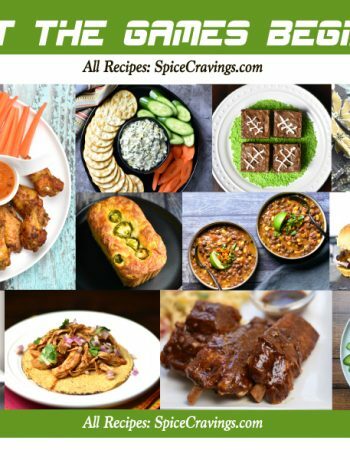 Hope you enjoy more of my recipes!